After witnessing history on Friday, Mason will have to step their game up if they want to win their next game. FAIRFAX, VA – After witnessing history on Friday, Mason will have to step their game up if they want to win their next game. 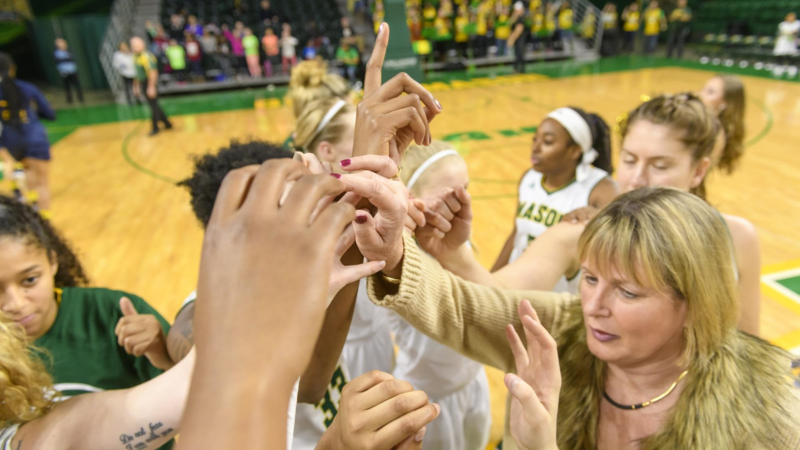 George Mason (24-9) will face Virginia Tech (19-13) in Round Two of the WNIT on Sunday, March 18th at 2pm in Blacksburg, VA. The season is on the line here and we have to take this team very seriously. Their record may say one thing, but their stats definitely say something else, all you have to do is read between the lines. The Hokies are in the ACC, the Atlantic Coast Conference, a heavy-hitting conference. While VT might have 13 losses, all but 3 come from the ACC and, like Mason, VT has not lost this season to a non-conference team at home, which is worrisome. Mason on the other hand is 1-3 in non-conference away games. While VT’s stats are similar to Mason’s, the strength of the conference in which VT plays kind of skews the numbers to look a lot nicer than they actually are. If Mason wants to win on Sunday, they’ll have to bring their A-game as their record-breaking season could come to a close. From what I can see, in order for Mason to win on Sunday, they’ll have to score in the paint, while at the same time scoring off of every turnover that VT gives them. VT also shoots a lot of threes, they attempt almost 25 per game, and if Mason wants to win, they need a strong perimeter presence, much better than what they had against Stephen F. Austin on Friday. A 2-3 zone or tight man-to-man coverage is something that would best fit VT. Furthermore, if Mason can out-rebound VT and score off of those defensive rebounds, and do well from the charity stripe, they’ll have a good chance of winning in Blacksburg. One last thing that Mason will have to bring to the game on Sunday, discipline. This is key. VT makes about 14 free throws on average with a percentage on the season of almost 73%. I guarantee that 14 points will make or break this entire game. If Mason can limit the number of personal fouls they receive and keep VT away from the foul line, I think they’ll be able to pull this off. Additionally, VT sometimes goes overboard on the personal fouls and Mason will have to capitalize on those opportunities to stay ahead. VT Is a Great Team. From what I can tell, VT is a great team and to not give them that credit would be doing us a disservice. Mason cannot be overconfident in this one and also let them get in our heads. In order to win, Mason needs to stay focused and work together to keep their season alive. VT Does Not Let Up When They Are Losing. VT was losing on Friday to Navy at halftime by a score of 37-24. After VT came out of their locker-rooms, they did not allow Navy to score double digits in either of the next two quarters, out-scoring Navy 32-18; talk about a comeback. Mason has to establish their presence in the paint early and not let up on the gas throughout the entire game. Once Mason lets up on that pedal, the score will be going in the opposite direction. THIS IS ONE AND DONE. Even though these are uncharted waters to us, this tournament is still one and done, and as I discussed in my previous article, the last thing Mason wants is to let this run go to waste. A regular WNIT banner in Eagle Bank is nice, but I personally prefer a WNIT championship one instead. Let’s go win this game. Best of luck to you all. See you Sunday. Check gomason.com for more details regarding Sunday’s game and stay tuned for more content from WGMU.